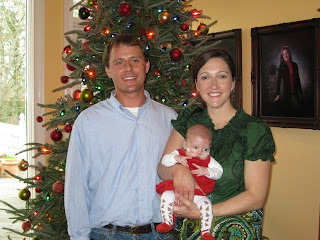 Blair's first Christmas was a great day. Brad and I took Blair to our parents' house for food, family, and fun. It was a perfect day for Blair's first non-doctor outings! Santa came to see Blair, so she's got a few things to grow into! We had breakfast with my family. The large family, getting larger! We had to bring Gus to see his grandparents, too. Blair's great-granddaddy Pop was there to see her for the first time! She's his first great-grand. ...and then she slept. Noise is no issue for this one. Afterwards, we played at home until we were worn out! Then, we had supper with Brad's family! ...and she slept there too. 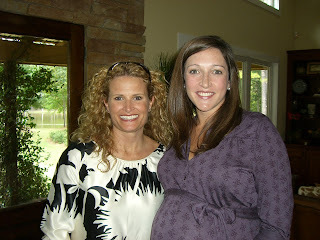 This is my friend Robin with me at my baby shower. We met when she came to my school during my last year teaching there. We became friends and spent a lot of time together during that year. I have had the best time at her house with her and her precious baby boys. She is one of the most hilarious people I know. She is a wonderful friend and is one of the many of you who has kept up with Blair's recovery and prayed for us. Robin is in the hospital this week after a car accident on Monday night. 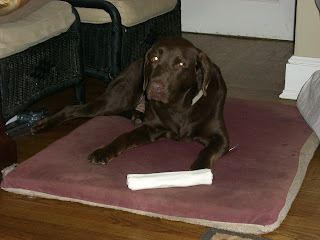 She has quite a few broken bones in her lower body and is having various surgeries to repair them. 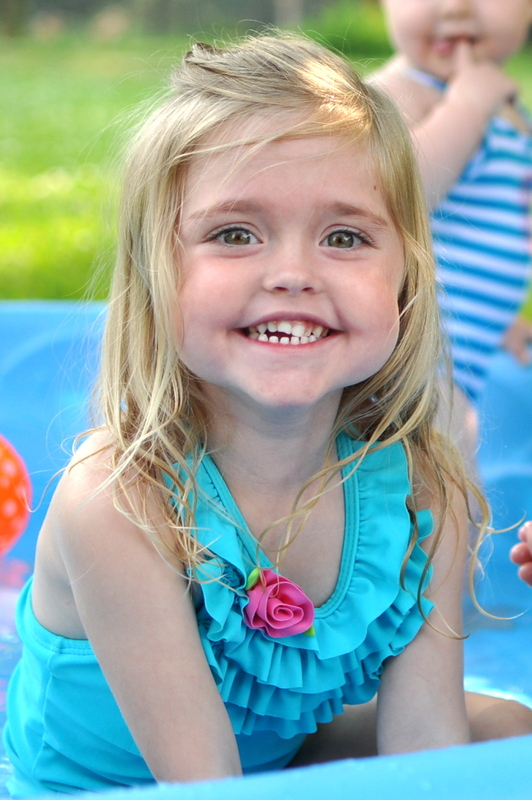 She is just at the beginning of a long road of recovery, so please pray for her and her family. 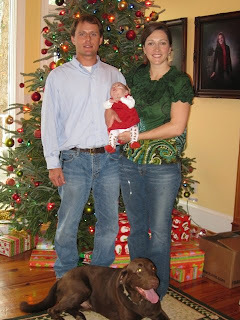 I have enjoyed getting ready for Blair's first Christmas! I haven't put up near the decorations I had last year, but we have a tree! I love a big fat frasier fur, but this year I put up an artificial tree that I found in the attic. It's what they call a slim. It's slim alright. It's about 8' tall and 2' wide! It looks like it came straight from Whoville. I wasn't too excited at first, since it looked lost in our den, but it turned out pretty cute. Blair has enjoyed her precious pink, green, and blue tree in her room that her aunt Melissa made for her. It goes perfectly with her bedding. She loves the lights. I do too, since it's the perfect amount of light to change a diaper in the middle of the night! 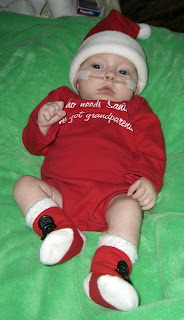 Blair looks so cute in her Christmas outfits and pjs. 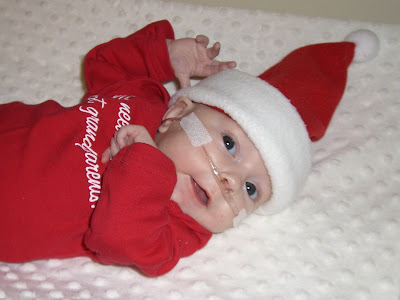 We are so thankful this year to have Blair and to have her home. God had been so good to us and has answered so many of our prayers. Most of all, we thank God for Christmas and the birth of His Son. Today was the big day that our favorite brown child came back from vacation. Since right after Blair was born, Gus has been staying with my parents and playing with their furchild Lola. My dad has become quite attached to Gus, so I think he was sad to see Gus go -- even if he did break into the dog food container and eat 10 pounds! I don't know what about Gus made my dad fall in love with him so. Could it have been his expert counter surfing moves? his I-knew-that-was-wrong-but-I-did-it-anyway head duck? his practice-made-perfect poor, pitiful me look? the way he follows his person from room to room? or the paw on your knee to tell you he loves you? They all got me from the beginning, and I'm so glad he's home! 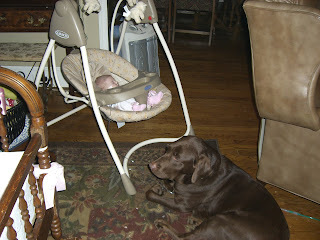 He promptly went as close to Blair as he could get and "talked" to her with his little grunts like he does to our cat. Is that good? It will take some time for him to get adjusted, but he's doing well. He took a few strolls around the house to scope out all the new scents, nosed his way through the cradle bars to check out the foreign grunt noises, and moved his head to the beat of the swing to see what was in there that was smelling so different! He perks his ears and stares at the baby monitor when it makes noise. He'll be a great big brother! 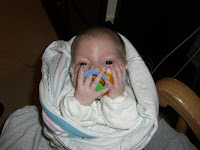 Another thing that Blair loves is her pacifier! Forget picking one that she loves and not taking any other -- she likes them all! After being at home for a week, we are settling in and working on getting into somewhat of a routine. Blair has tried out just about all of her toys. She learned to self sooth early, so she is content where ever we put her -- for the most part! She LOVES this red bird that came with the activity gym. She will stare at it forever and follow it from side to side. 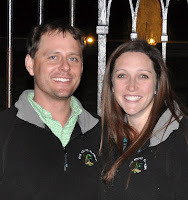 We had a nice stay at the Coliseum with Blair on Monday and Tuesday nights -- if you can actually say that about spending the night in the hospital! 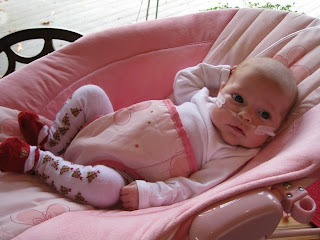 I brought a bouncy seat for her, because at almost two months, Blair is spending more time awake and found that crib to be quite boring. 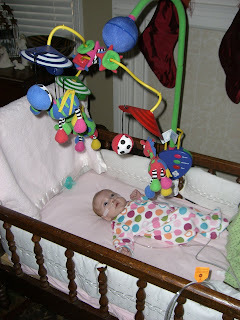 Thank goodness they had a swing for her with a lovely construction paper mobile that Stacy made! We packed up and headed home Wednesday afternoon. Blair had plenty of stuff to bring home. The nurses spoiled her. Daphne had made her a pumpkin name tag for her crib and another pumpkin telling everyone that Blair is sensitive to tape! 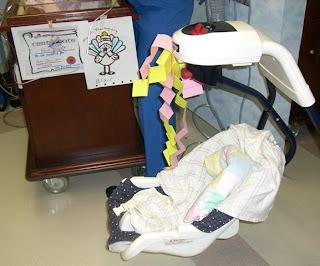 She had a "My first Thanksgiving" turkey, hung on her bed by Kathy during day shift, and Regina colored it that same night. Kathy also made her a certificate of merit saying how proud they were of Blair. 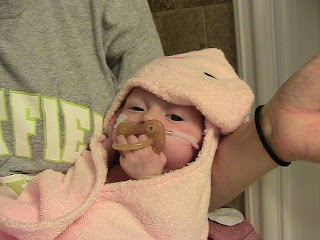 She had an angel ornament from Stacy and some pictures that Stephanie took of her first bath. 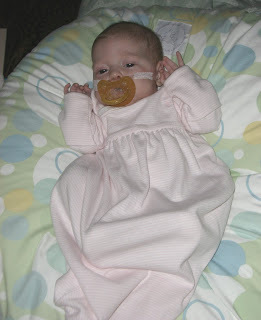 We also were able to keep her beautiful crib blanket from Project Linus. I was so emotional. Of course I was so happy to take Blair home but nervous, scared, and sad to leave the ones who have become family during the last two months. 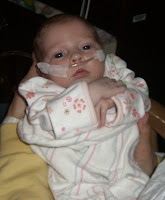 Before leaving our room, we had to make a quick trip through the NICU one last time to say goodbye to everyone. 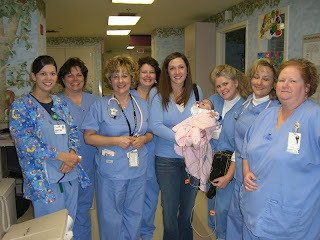 I spent a ton of time with the nurses and respiratory therapists working with Blair, and I enjoyed everyone so much. Not to mention they all loved Blair to pieces and took such good care of her. 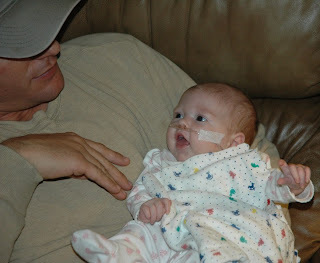 Brad and I are forever grateful that God provided such wonderful people to take care of Blair while she was sick. We didn't make it home last week, but Blair is doing well! She's got some fat cheeks and weighs just shy of 7 pounds. Her x-ray today looked good, and I think they have the vitamins and iron sorted out so that they don't bother her tummy. We're going to try to bring her home on Monday or Tuesday. We'll be spending the night at the hospital again Sunday night. Keep praying that she continues to improve and doesn't have a hard time with the transition from the nursery she's called home for almost two months! 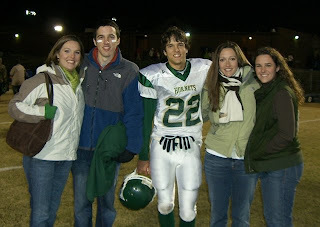 Tonight the football team of my alma mater (and workplace for six years) is playing for the state championship. We have never won the state championship, but has been state runner-up a few times. I have been to each of the Hornets' tries for the state championship, but this year is a bit different. This time my little brother is on the team. Because of his injury last week, he won't be able to play, but I'm so thankful he is well enough to attend. He's calling the toss to start the game off right! I hope this is our year! Good luck, Hornets! a great smile even though he was holding his breath in pain! At this point we had no idea how badly he was injured. Our going home today was not meant to be. 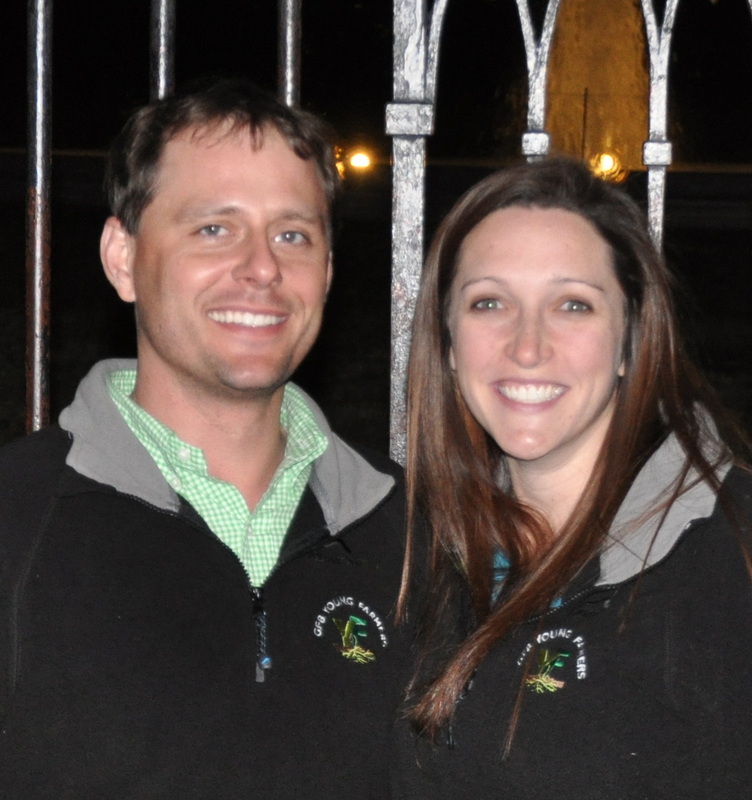 Blair had a rough night with us last night, and we were glad to be able to call Stephanie and Mark, the nurse and respiratory therapist on duty. She got wheezy, and when a tummy ache from new vitamins made her mad, it got worse. I was able to calm her down, and the breathing treatments we gave her helped, but she is working a little to breathe still. They ended up doing a chest x-ray to see what was going on. 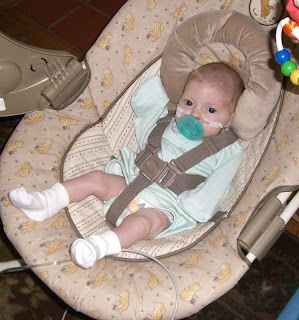 It turns out that it was not the best idea to stop the breathing treatments earlier this week. 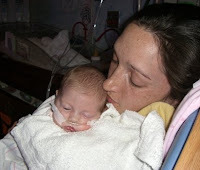 She went back on a 6 hour schedule on Monday, but the two days she didn't have them regularly allowed her lungs to get clogged up in places. 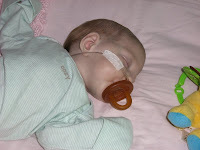 They are going to give her a burst of steroids and stop the multivitamin for now. We should see vast improvement in the next day or so. Monday will be the earliest we think about going home again. The whole thing is disappointing but not too upsetting, because now I feel more prepared to deal with a situation if something like this were to happen at home. The doctor said this type thing, unlikely still, would be the worst we would see. Until now, she had not had an episode like this is probably three weeks. 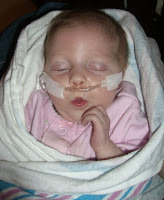 Still, during the whole thing her oxygen saturation dropped but wasn't terrible. We're thankful for the learning experience and look forward to next week to see what God has planned for us. It is a blessing too that my mom more available next week, since she's been with my brother this week. He is doing better and may get to go home today or tomorrow. Thank you for your continued prayers for all of us. So...WE'RE GOING HOME! Praise God from Whom all blessings flow! The plan is to spend the night in the hospital on Tuesday night and head home on Wednesday if all goes well. We're so excited and a bit scared, I guess. 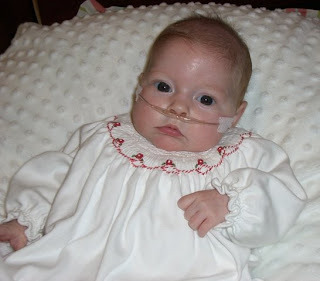 Blair will still be on oxygen and breathing treatments, so we do have a few things to learn between now and then. She is growing! She weighs 6 pounds 10 ounces now. 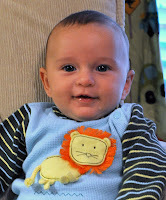 We got to start breastfeeding on Saturday. That is going well, so I'm excited. Pumping is such a huge time commitment, so I hope that soon I won't have to as much. We pray that we can get home and that God is with us as we go it alone -- well, at least without our nurses who have become like family! In other news.... My brother John was tackled (helmet to ribs) while diving for an onside kick during the football game on Friday night. He has a second degree liver laceration and is in ICU at the Medical Center. He got two pints of blood and some plasma yesterday. The doctors are watching his hemoglobin counts to see if they will have to do further treatment. If needed, they can do an arterial procedure to try to clot any bleeds. Right now though, he is just under observation. I think he feels ok. They have him on pain medicine that makes him itch, so they give him benadryl, and he's out. Please pray for his recovery as well. We have had a big weekend, to say the least. I haven't been able to post, because my internet has been down in my RMH room, but I'll try to do better when we get home! Thanks for your continued prayers. 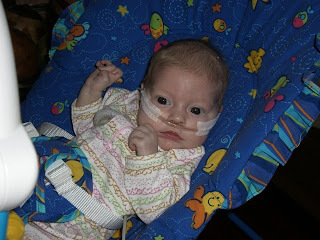 Miss Blair is still doing great, making us laugh with those hands, cute faces, and huge sneezes. She's up to 6 lbs 9 oz -- she's been eating a lot this week! She took 4 ounces during four feedings yesterday. She's such a piglet. She took over 3 ounces each feeding today, so she rested a bit from her Thanksgiving a week early! She was so hungry this afternoon when I got there to feed her. 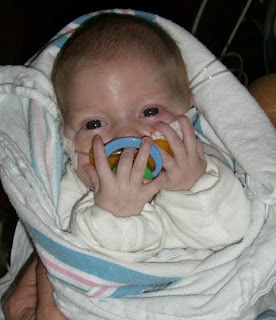 I guess she thought if she pressed her paci with both hands, something would come out of it! She's still holding on to that last bit of oxygen. They haven't been able to wean her lower than the 25%, and sometimes she needs a little more. 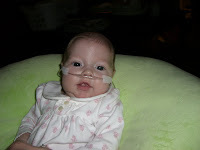 Dr. Connor increased her heart medicine slightly, hoping that may help get the oxygen requirement down some more. Her echo on Wednesday looked good though. Dr. Rodriguez comes back tomorrow for several days, so we'll see what he says about her chances of going home soon! 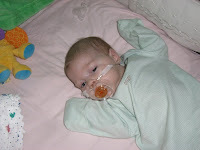 Blair's oxygen level stayed mostly in the 25% - 30% range Wednesday, which is good. She had good stats on 25% while I was there this evening. 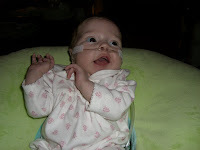 Dr. Connor thinks we might be able to go home without oxygen, so they will continue to try to wean her off of it. Mark, one of the respiratory therapists, is there tonight, and all the babies seem to straighten up when he's on duty! I never know what new settings of Blair's I'm going to find the morning after Mark has been there -- it's usually good though! 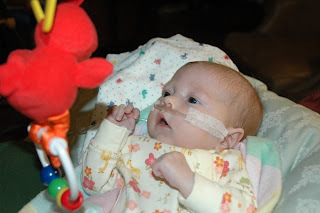 The doctor ended up changing her feeding schedule this morning, so now Blair gets as much as she wants every four hours. She drank 3 ounces this evening. She drinks a bottle in no time. Eating is not a problem for this child! She weighed 6 lb 6 oz tonight. 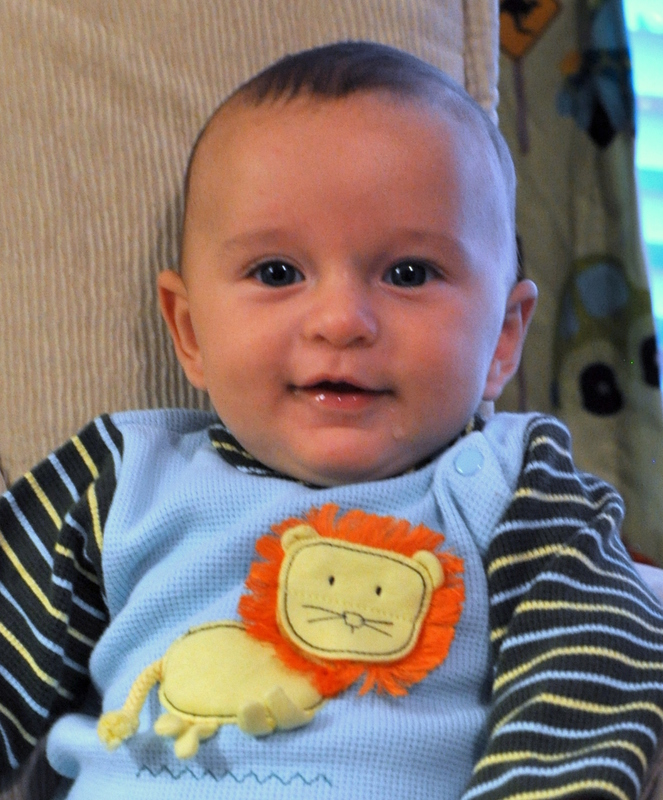 Blair is six weeks old today. She is staying awake more now. She surveys all the movement and lights all around the room. She's gotten a bit spoiled though and lightly coughs when she wants attention! I think she deserves some spoiling! The nurses certainly don't mind helping. 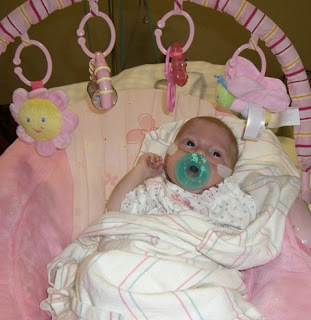 They got the nursery swing out for her today! They said she enjoyed it. Last night, Jay's Hope Foundation provided supper for us families staying at RMH. Jay Gaskins battled cancer for 2 1/2 years and passed away almost three years ago. 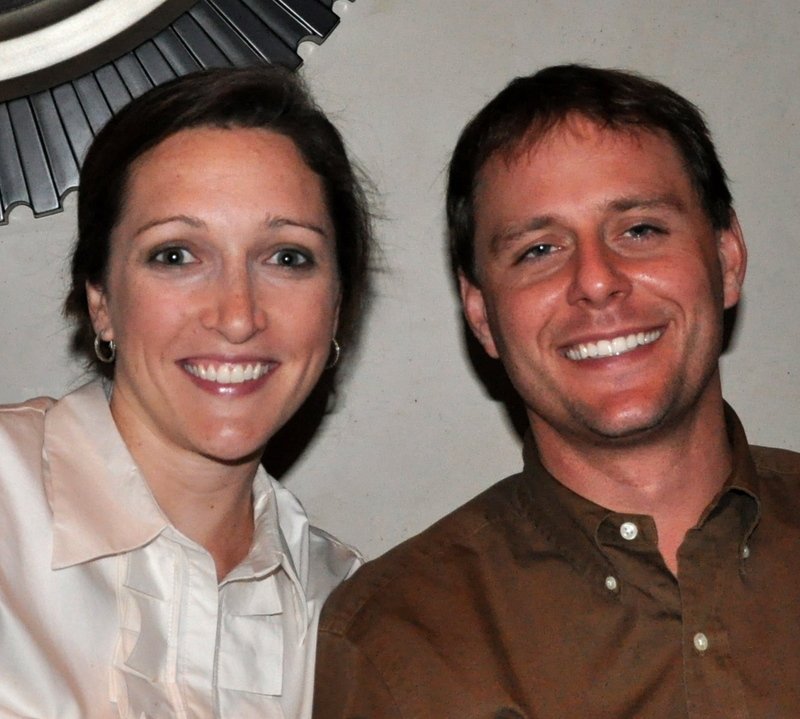 Jay's parents Cindy and Jason Gaskins founded Jay's Hope to provide support to families who have children with cancer. Cindy shared a verse with us during prayer and devotion after supper. The verse really touched me, so I thought I would share it. circumstances, for this is God's will for you in Christ Jesus. I have thanked God many times for the past six weeks and all that He has taught me during this time. I do realize that there are so many who have a road much longer and more difficult than ours, and I pray for God to give them strength. I hope that I will always be reminded to be thankful in all circumstances. I just talked to Blair's nurse. I wasn't able to feed her this evening, because they got a new admission, and we aren't allowed in the NICU while they are admitting a baby. So, I just called to check on her. They increased her feedings again today to 70 cc (over 2 oz) every three hours, and she has done well with it. That is a lot of milk for every three hours. The nurses keep expecting the doctor to change her to a four hour schedule, but he hasn't. Her weight has never really been a concern, but she weighed about 6 lb 5 oz last night. That is about a pound above her lowest weight. 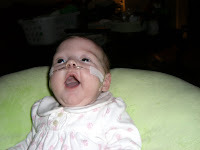 Good news -- the night nurse said that her oxygen is down to 25%! This is the first time she's been in the 20s. And, the oxygen is on 2 liters, which is not a really high flow. Cherry, her nurse for the day, said Blair's lungs sounded better than ever, and the night nurse agreed. 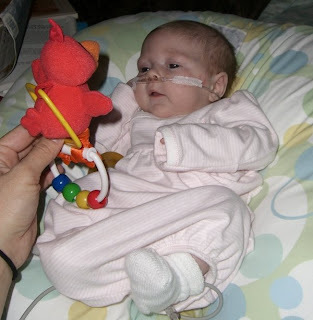 Cherry thinks that the medicine she's taking for her heart is making a difference. I sure hope so! They'll do another echo tomorrow. It's so funny. 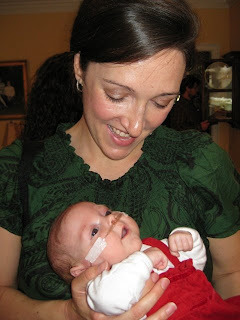 I can't even count the times a nurse or I have said, "She's like a different baby." Every time there's improvement, she looks so much better. We think she's great, but then she's a "different baby" again four days later. It's nice to see this "different baby" though after last week with not much improvement. Maybe the home stretch...? No more mention of it, but we'll see. 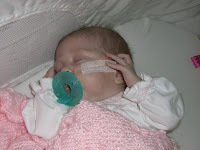 Blair's nurse ended up taking her feeding tube out yesterday, since Blair was waking up for all feedings and had taken a bottle for every feeding since Saturday morning with no problems. 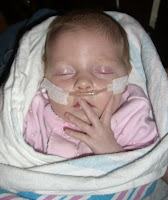 She eats really well, and she is not falling asleep or getting as tired during feedings as she was. She wakes up right on schedule ready to eat, and she only cries if she gets really hungry. She is a really good baby. Blair and I are getting good rocking time lately, since I'm at the hospital every three hours during the day to feed her. She loves her "groceries" as the nurses call it. She also loves to be rocked and loves to be talked to. She stares at anyone that talks to her with those huge eyes. When we rock, I sing (really I'm better at humming) songs that I learned as a child. My cousin and I spent the night with Mema all the time when were were little, and she sang to us at bedtime. We were never tired, of course, but I can still hear her tell us in a whisper to "lie real still" while she sang. 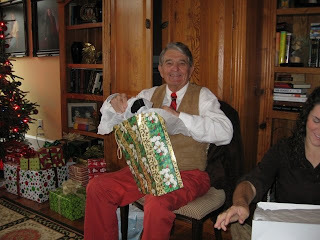 One of my most vivid memories is of my cousin Wes who insisted that the girl come "'Round the Mountain" in a little red car. That was not my favorite verse, because she was supposed to drive six white horses! Mema also sang "Love Lifted Me," "Jesus Loves the Little Children," and many more. I know she looks forward to singing to Blair when we get her home! I thank God every day for Blair and for all of the prayers that are said for her and for us. So thank you to all of you who keep up with us and pray. I believe in its power, and Blair is a perfect example of many answered prayers. 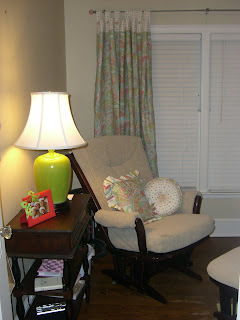 Mom and I went down to my house today to work on the last few things for Blair's room. We needed to hang curtains and put the letters that spell her name on the wall. Thank goodness Brad stopped by to help, because we had just about made a mess! We didn't get to hang the letters, because that would have meant that things around here always run smoothly, and they hardly ever do! I actually lost my car keys between yesterday afternoon and today. I have YET to find them. Since I had packed my car full of stuff that I needed to take home but couldn't get into my car, I had to leave it (with the letters inside) at the RMH and get mom to take me home to get my extra keys. That's the way it goes. 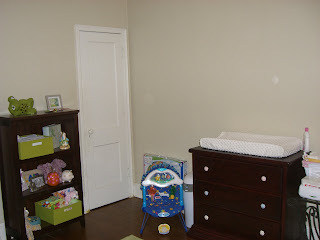 The nursery looks precious though. I absolutely love it! 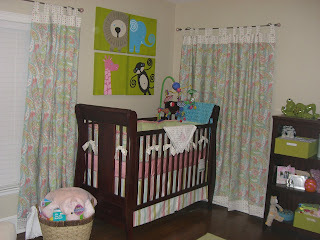 I got Blair's bedding from Javis Davis, a custom bedding company in Alabama and had some curtains made to match. At my baby showers, Blair received some precious picture frames and decorative things that added finishing touches to the shelves. 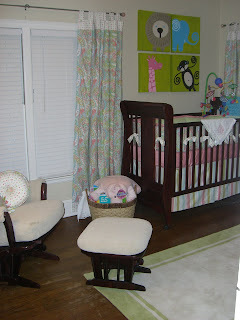 Aunt Linnie did the precious paintings over the crib. Blair's Grandmom and Andad, Brad's parents, gave us the glider that I can't wait to use! 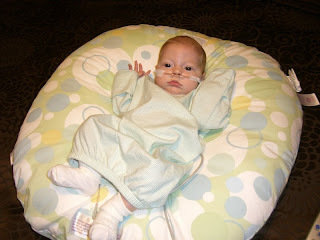 Blair and I enjoy glider time in the hospital nursery, but it sure will be nice to use our own glider that reclines!